In mid-January, New Mexico dropped back-to-back games against San Diego State and UNLV, the two best teams in the Mountain West Conference. The losses snapped a 13-game winning streak, and relegated New Mexico to the back burner of mid-major discussions. SDSU and UNLV were ranked 16th and 20th at the time, and when New Mexico had to repeat the two-game gauntlet last week, the Aztecs and the Runnin’ Rebels had climbed to 15th and 11th, respectively. 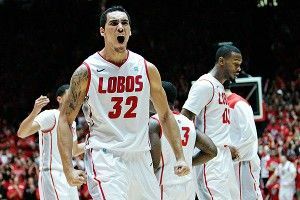 But this time, the Lobos won by 10 at San Diego and clobbered UNLV at home by 20 points. A lot had changed in a month. The wins earned them an AP Top 25 ranking for the first time all season (18th), essentially locked up a Mountain West regular season title, and directed our attention to the fact that this might be one of the 10 best teams in the country. I’d say it’s high time we had a good look at the 22-4 New Mexico Lobos, Q&A style. Seriously, where is Murray State? Q: Is the campus in Santa Fe or Albuquerque? Q: What are some fun facts about the state? A: Its nicknames include “The Land of Enchantment” and “The Land of the Delight Makers.” Sadly, the Enchanters have been warring with the Delight Makers for centuries now, leaving the entire region scarred by tragedy. Q: Let’s get serious. Who’s the star? A: That would be senior Drew Gordon, a 6-foot-9 rebounding machine. Gordon snags 28.8 percent of all defensive rebounds, the fifth-best rate in the country, and he saved two of his best performances for last week’s wins. Against San Diego, he scored 17 points and grabbed 17 boards, but that was nothing compared to what he had in store for UNLV — 27 points and 20 boards. He also averages 12.7 points per game and shoots 72 percent from the line. At the moment, Gordon is on the outskirts of the first-team All-American conversations, and will likely make the second or third team unless he catches fire over the next three weeks. Q: Who are the lesser lights? A: If you’re a fan of mid-majors making deep runs into the tournament, New Mexico will make you salivate even more than our old pals Wichita State. Everything you could possibly want is present in the Lobo lineup. Scoring guard: Kendall Williams, a 6-foot-3 sophomore, averages 12.3 points and 4.1 assists and apparently loves chess. He’s lightning quick and scores most of his points inside, but he shoots 3s at a respectable rate too. Shooters: This is the 16th-best 3-point shooting team in the country. Tony Snell, another sophomore, is one of the most accurate shooters around, with an effective field goal percentage of 62.0. The fact that he’s 6-foot-7 and shoots 42.3 percent from beyond the arc makes him incredibly dangerous, and his driving ability adds to the package. He averages 11.8 points per game, and he’ll be one of the keys to New Mexico’s late run. Jamal Fenton and Phillip McDonald are even better from the outside coming off the bench, shooting 43.5 and 45.7 percent, respectively. Height: Cameron Bairstow, 6-foot-9, and A.J. Hardeman, 6-foot-8, give the Lobos a second and third rebounding presence to complement Gordon. Williams and Snell rebound well from the guard position. Experience: Williams and Snell are sophomores, but aside from freshman point guard Hugh Greenwood (an Aussie like Bairstow, both of whom followed in the footsteps of former Lobo Luc Longley), the rest of the team are upperclassmen. The juniors and seniors hold the memory of a 30-5 record and a first-round NCAA win over Montana in 2010, and last year’s squad made the second round of the NIT. It’s not much, but it’s experience nonetheless. Depth: There are nine players on the roster averaging at least 13 minutes per game, and the scoring after the top three is very balanced. Q: What is this team’s bread and butter? A: Defense. As capable as the Lobos are on offense, they’re superlative on the other end. KenPom has them ranked fifth in raw defensive efficiency in the country, and their greatest strength is in the simple act of contesting shots — on the perimeter and interior both. They force turnovers and block shots at a decent rate, but more than anything, opposing teams struggle to make baskets. The Lobo length doesn’t hurt, nor does the quickness of players like Snell and Williams. What’s really impressive, though, is that they do it without fouling; teams reach the line against New Mexico’s aggressive man-to-man defense at the 53rd-lowest rate in the country. A: None other than Steve Alford, the former national champion at Indiana whose junior season under Bobby Knight is chronicled in the A Season on the Brink. Alford has been at New Mexico since 2007, and coached at Iowa and Southwest Missouri State before that. In his final year with the Bears, he reached the Sweet 16 with wins over Wisconsin and Tennessee, and that’s still the furthest he’s been in 17 years as a Division I head coach. In 2007, he took over a Lobos program that had enjoyed just one 20-win season in five years under Ritchie McKay, and went on to accumulate at least 22 wins in the five years since. He’s made the NCAA just once, but was on the bubble every other year. This is arguably Alford’s best team to date, alongside the 3-seeded Lobos of 2010, and his greatest chance to return to the Sweet 16. Q: What’s the conference situation? A: New Mexico has four games remaining — away against Colorado State and TCU, home against Air Force and Boise State — and enjoys a two-game cushion on SDSU and UNLV at 8-2 in the conference. While the Rams of Colorado State may give them a game tonight, it’s very, very unlikely that New Mexico will lose any of the other three. Thus, they should prevail as regular-season champs in one of the two best mid-major conferences in the country. Q: But will that be good enough to make the tournament without an MWC tournament win? A: Almost definitely. The committee won’t love to take three teams from a smaller conference, but when all are ranked, what other choice will they have? And SDSU and UNLV look far more likely than New Mexico to collapse at the end of the season and give them an easy way out. Q: Isn’t New Mexico’s home court famous? A: The Lobos play in an all-basketball arena called “The Pit.” The surface of the court is 37 feet below ground level, and in 1989 the noise was measured at 118 decibels, the highest in college basketball. This place is completely insane — they even post signs in the visitor’s locker room warning opposing players about altitude sickness. I’m not sure if that’s a health thing, an intimidation thing, or some combination. All I know is they rank in the top 20 in attendance every season, the fans howl like wolves, and as of 2010 the Lobos had won 82 percent of their home games since The Pit opened in 1966. Legit. Q: What’s the tourney outlook? A: Couldn’t be better, as far as I’m concerned. With a lot of mid-major teams coming back to earth as February unfolds — San Diego State and UNLV, but also Creighton, Saint Mary’s, and Gonzaga — New Mexico is one of the few headed in the right direction. Barring a horrendous draw, they’ll be favored by the metrics to make the Sweet 16. The only other mid-major team who can make that boast is Wichita State, and it should be no surprise that those two teams are shaping up as the only mid-majors with a prayer of making the Final Four. (Murray State is coming off a great win over Saint Mary’s, but the Racers are largely dependent on one player, Isaiah Canaan.) If you’re a risk-taker and are looking for an edge in this year’s bracket pools, make the Lobos and Shockers your Butler and VCU of 2012.